For engineers, vibration analysis is key for both understanding and predicting behavior in complex structures and processes. Vibrating structures can include bridges, buildings, and aircraft - all of which require extensive research and understanding in order to ensure reliable and safe construction. In this tutorial, beam vibrations will be measured to demonstrate a real-world example of a vibrating sturcture. The study of beams is important because they are inherently susceptible to vibration due to their long and thin construction and high stress applications, such as aircraft wings or bridge supports. where E is the modulus of elasticity, I is the moment of inertia of the cross-sectional area, ρ is the density of the bar material, and A is the area of the section of the bar (assumed constant in uniform bar). The full derivation of the general solution can be downloaded here. These boundary conditions state that there can be no shear or bending at the free ends. If we were to clamp or simply-support the ends, these conditions would change. Which we can solve using a numerical method. I attached a Python code which approximates the locations where the equation is valid, and plotted the zero locations found by the algorithm below. The first ten non-zero roots are shown on the plot below. Beyond this range, it is my belief that the computer program has trouble resolving rounding issues with the logarithm in the cosh() function above, resulting in larger error. The first seven modes below, however, have errors less than 0.0003 in their zero approximation of the root. The routine above uses an iterative routine to approximate the zero-crossing for the transcendental equation so that the modes of the beam can be approximated. This will be essential for finding the natural frequencies of our bar and is a general practice for any equation that has no analytical solution. From the routine above we can populate a table of values for γL, which will in turn help us observe the modes of the beam. where D is the diameter of a cylindrical rod and n is the mode number. The other parameters, ρ and E, are the density of the bar and Young's modulus, respectively. The first modal frequency is shown below (calculated using the particular solution, the numerical solution to the transcendental equation, and the specific equation for frequency from our geometry). I used: D = 0.008 m, ρ = 7800, E = 200 GPa, and L = 0.5 m.
The first four modes of the vibrating bar (defined down to 0.1 Hz -> the max resolution of the acquisition sampling) will be compared with the actual measurements of a bar in the experiment to follow. The voltage divider is necessary for lowering the output signal from the piezo sensor to 1.5 V (from 5V), which is the max input for the Behringer UCA202. The Behringer UCA202 samples the piezo vibrations at 44.1 kHz (or 48.0 kHz), and the piezo film measures small deflections from the vibrating bar. This is the simple setup for the vibration analysis of the bar using the piezo element and the RPi. In the next section, the measurement methods will be introduced as well as some Python routines for acquisition and analysis. A free-free bar should be suspended without interference when measuring its natural modes, however, this is impossible. The simple way of avoiding interference is to support the bar at specific mode nodes. For example, we can use the solution for the vibrating bar at particular modes and find the locations that have no deflection. The image shown here shows the piezo sensor fixed to the edge of the steel cylindrical bar. This method enables the piezo film to measure the quick deflections taking place at the end of the bar due to induced vibrations. This animation agrees with the literature and other similar studies done on free-free beams. A great example of the free-free beam modes can be found on the popular: hyperphysics.phy-astr.gsu.edu website, where they state the same zero-locations found for the n = 1 case. In the next section, the theoretical frequencies will be compared to the values measured at the support locations outlined in the table above. Below is a series of four plots, each containing data sampled at 44.1 kHz for 10 seconds (resulting in a frequency resolution of 0.1 Hz). 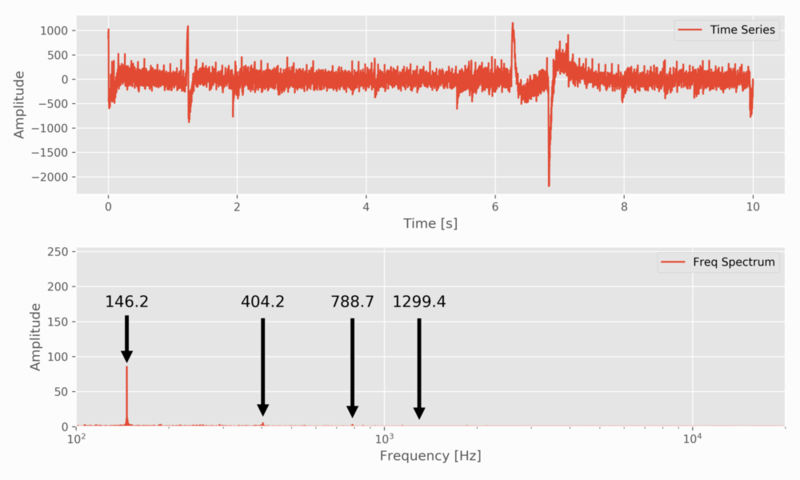 Both the time series and FFT of the signal are displayed. For each support location, the frequencies pertaining to the particular location is indicated by an arrow and were used as the measured value for each respective support location. It may or may be obvious that the values are consistently higher than the theoretical calculations. This could be a result of a multitude of errors in machining of the bar, approximation of the elastic modulus, errors in the measurement method - it’s hard to say. However, one hypothesis we can at least attempt to correct is the elastic modulus. At this point, the elastic modulus can be changed to narrow down the error between the numerical calculation of frequency and the measured values. The results demonstrate that if the proper support locations are used for measuring specific frequencies, the error between theory and measurement can be approximated within 1%. This also suggests that the resonant method using a piezo element is a viable option for approximating Young’s modulus (elastic modulus) for different materials. This experiment has demonstrated several theories in engineering. 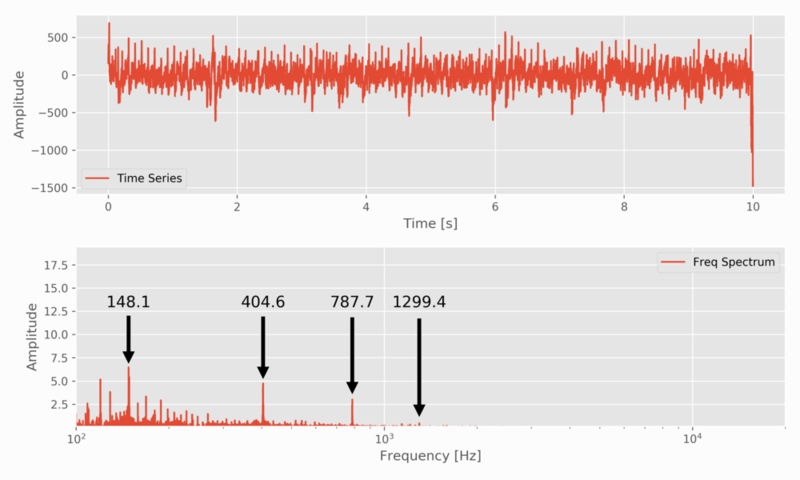 The first: the Raspberry Pi is capable of handling a robust vibration analysis - something that is impressive considering the traditional requirements for conducting such an experiment. Second, the closeness of theory and experiment indicates that our assumptions are correct and the measurement methods are also accurate and acceptable. 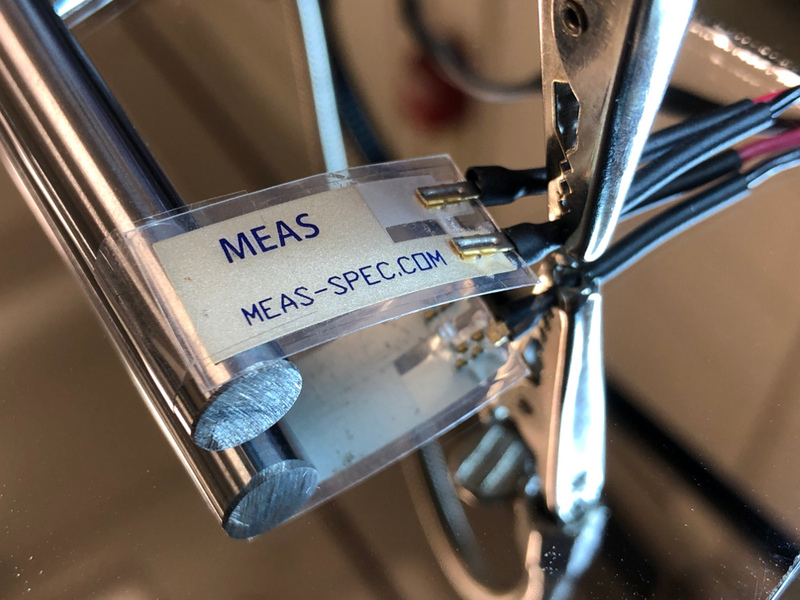 This builds confidence in the user’s ability to conduct similar experiments on new materials with unknown properties - something that may be useful in industry. The goal of this tutorial and experiment was to endow the user with a sense of real-world parallel to a complex engineering problem. The principles employed here utilize skills in solid mechanics, partial differential equations, experimental analysis, and data analysis - all of which are useful to an engineer. Another intention of the experiment was to demonstrate the capabilities of the Raspberry Pi and conquer a difficult, real-world problem that is able to be solved with inexpensive and open-source tools.